You can register for courses works when your school has set up online enrollment periods. Online enrollment periods start on the date of your school's choosing and conclude at the course or term's add/drop date. During these periods, you can enroll in courses, sign up to audit them, drop courses, and get on the waiting list. When you log in to Populi, you'll see an alert on your Home page that looks like this. 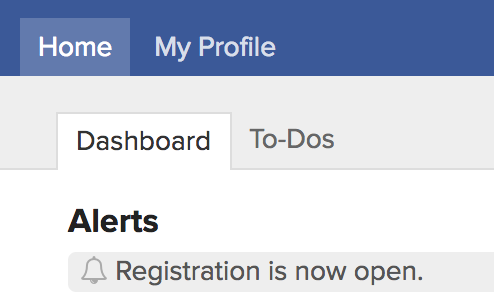 Click the alert to go the registration page. Go to My Profile and click the Registration view. Selected Courses are those you've registered for (or hope to). Enroll/Audit: Toggle between courses you can enroll in or audit. Show Available courses with no conflicts: These are courses that match your program and campus and for which you've fulfilled the prerequisites (or are currently enrolled in a prerequisite, corequisite, or equivalent) and with which you have no schedule conflicts. Additionally, if there is a term max enrollment limit, it shows courses which fall within that constraint. Show Available courses: These courses include the above together with courses that have schedule conflicts and max enrollment conflicts. Show All courses: This shows every course offered in the term, whether or not you can register for it. Whether the course is available for enrollment and/or auditing, how many openings, and credits/hours. Conflicts appear in red: schedule, prerequisites, and term max enrollment constraints. If you've already passed this course, you'll see a notice that she's already passed it. This does not prevent you from registering for that course. lets you register for that course. lets you request a spot on the course waiting list. means that you cannot register for this course because of a conflict with schedule, enrollment limits, or unmet prerequisites. 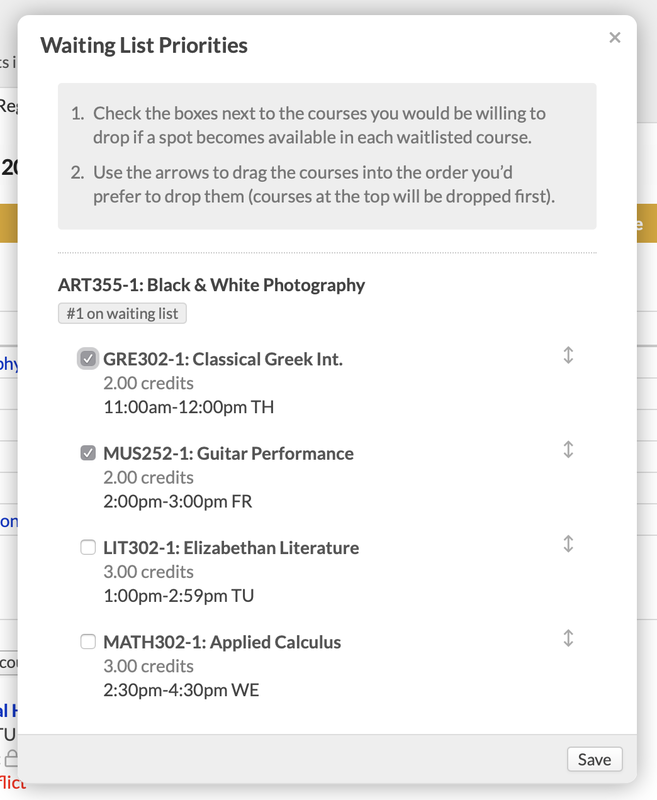 Using the drop-downs, choose whether you want to see courses to Enroll in or Audit and which Offered Courses you'd like to see (Available..., etc.). Click next to the course you'd like to add. Click to request a spot on the course waiting list (see below for more details). The course will be added to Selected Courses with an "Unsaved" badge. A notice will display above Selected; you can either Save the registration changes or Undo them. Offered Courses will switch back to show Available Courses. In all likelihood, new schedule and max enrollment conflicts will appear. If you enroll in a course that requires enrollment in a corequisite course, you'll be asked to also add the corequisite to Selected Courses. If you've made a mistake, click to remove the course. Repeat the above steps as often as necessary. When you're ready to submit the changes, click Save. You may be asked to sign an enrollment agreement (see below). Tuition, fees, and other charges may be generated for you on My Profile > Financial > By Term. How do I audit a course? Select Audit in the Enrolled/Auditing selector by Offered Courses. Click or next to the courses you'd like to audit. Confirm your choice(s) and then save the changes. Find the course you'd like to drop under Selected Courses. Click to remove the course. How do I get on a course waiting list? If your school permits it, you can get on the waiting list for limited-enrollment courses that are already full. Your school may also permit you to get on the waiting list for courses that conflict with your schedule or maximum enrollment limits. To see courses you'd like to get waitlisted for, you may need to select Available Courses from the drop-down. Click to request a spot on the course waiting list. Click add to list the course under Selected Courses. 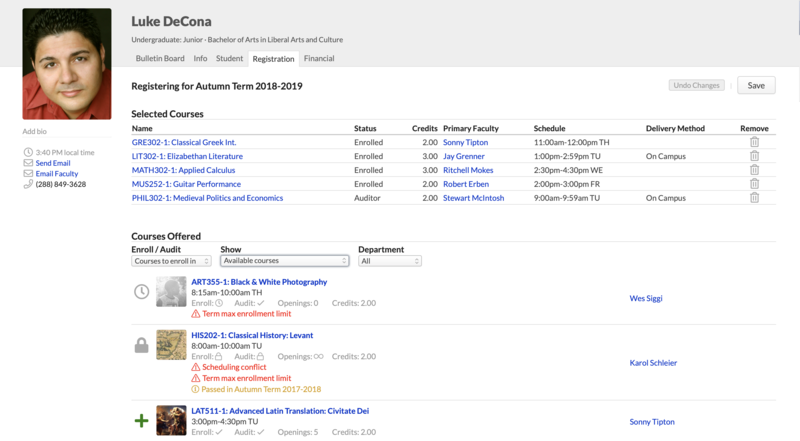 When you Save your registrations, you'll see the Waiting List Priorities dialog if there are schedule or enrollment-limit conflicts with your other Selected Courses. Under each waitlisted course, check the radio buttons next to the courses you'd be willing to drop if a spot opens. Drag to put the chosen courses in the order in which you'd be willing to drop them (the top course would be dropped first, etc.). A spot opens up in ART355-1 (which meets 1:45 - 3:45 on Fridays). Populi checks to see if dropping GRE302-1 will resolve your schedule conflict. Turns out it won't. Populi checks to see if dropping MUS252-1 will resolve the conflict—which it does. You are dropped from MUS252 and enrolled in ART355. A similar process would happen for sorting out other conflicts. In case the conflicts cannot be resolved by dropping any of the chosen courses, Populi will remove you from the waitlisted course. 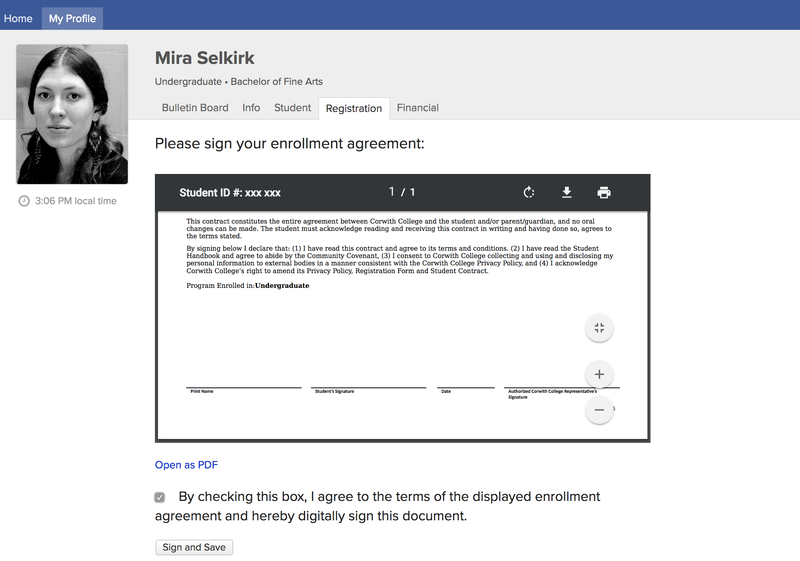 Your school may require you to sign an enrollment agreement after registering. You can sign it by checking the box indicating your consent to the terms of the agreement. You must sign the agreement within 24 hours of submitting your registration. If you do not, your registrations will not be approved and you will be required to re-register. If you do not immediately sign the agreement (for whatever reason), just return to the registration view (within 24 hours!). If you have any questions about the agreement, please contact someone at your school. Your school may opt to process registrations on a set date/time. It can also institute a registration "lottery", which randomizes the order in which your registration request will be processed. In such cases, when you save your registration, you are simply submitting it for later processing. You will not be able to change your registration request until your previous request has been processed! Select courses in consultation with your Degree Audit. The Degree Audit can tell you exactly what courses remain for you to complete your degree; it also enables “what-if” scenarios that show how your academic progress measures up toward other degrees. Registration will not give you the option to enroll in courses for which you have not fulfilled prerequisites. So, for example, sophomores can't enroll in courses reserved for seniors. However, the registrar can enroll you in any course; if you've been permitted to take courses not available to you on the Registration page, contact your advisor or the registrar. The registar or your advisor may apply a lock to your account. If that is the case, you'll see a yellow banner like this one at the top of the screen. As long as the lock is in place, you will not be able to make any changes to your registration—the registrar or your advisor must do so. If you're having trouble with registration, please contact a staff member at your school. If it's an academic issue, they can take care of it. If it's a technical issue, they'll tell us here at Populi! Can't wait to get started!! !